Powers/Abilities: The Recorder is composed of an unspecified ferrous alloy. Its information gathering instrumentation is located in its head component, analogous to eyes, ears, nose, etc. Its eyes take in data across the entire electromagnetic spectrum (radio to gamma rays), not just the visible spectrum. Its ears can register sounds from 0.3 to 150 decibel. The sampling rate for average events is every 0.01 second; for relatively more interesting events it is every .001 second. The computer data-processing system fills the entire chest cavity and has 40 terabytes (trillions of bytes) of information storage capacity. or "Observation: To think I once found your heroism entertaining." This Recorder additionally possessed implants that weren't Rigellian standard components in his sub-cortical matrices built in by some unknown corruptor. They seemed to be behavioral "inhibitors" and countermanded relays, placed in series along the primary command-ware. Observation: The implants turned this Recorder into an evil, corruptive being that provoked dangerous events to see more action. On Earth this Recorder also learned to use lower technologies to record events like video cameras and once he even used several automatic cameras to watch a few events simultaneously. (Force Works#14 (fb) - BTS) - After Hala's destruction the Recorder was found by Starstealth floating above their destroyed homeworld. Someone had reprogrammed the Recorder and filled it with information for Starstealth about the "true" architects behind Hala's destruction, Wonder Man and Vision, and the order to kill them. (Force Works#1) - The Recorder headed with Starstealth to Earth. It questioned Wonder Man while Starstealth attacked him and revealed its involvement in the whole situation. It told Wonder Man about Starstealth's plan to cause a chain reaction that would destroy Earth by causing a core meltdown in the Vision and an ionic overload in Wonder Man, and that their knowledge to do this was based on the Recorder's information about the heroes. The Recorder tossed Wonder Man to the ground when he touched it and then followed Wonder Man into space to watch how he stopped Starstealth's plan. Suddenly some Scatter vessels hit the Starstealth's ship and the Recorder informed Wonder Man that it would explode in 12 seconds. Wonder Man brought the damaged ship far enough away from Earth based on Recorder's information, and the Recorder watched Wonder Man seemingly die in the ship's explosion. Afterwards the Recorder returned to Earth and informed Iron Man about Wonder Man's death. (Force Works#14 (fb) - BTS) - Starstealth's mission had failed, and the Recorder decided to hide among Force Works to orchestrate dramas it could record. (Force Works#2) - The Recorder returned to the Works and entered it without PLATO sensing him. The Recorder wished to monitor Force Works' adventures in the future. (Force Works#3) - The Recorder met Century and PLATO on their way to Century's new quarter at the Works. Recorder was very interested in Century and once again didn't tell PLATO how it was able to cloak itself from PLATO. That evening Recorder cancelled an alert by the Chaos Computer without anybody's knowledge. (Force Works#4) - The Recorder annoyed Scarlet Witch at her morning training shortly before the Chaos Computer again brought up the alert the Recorder had cancelled the day before. (Force Works#5) - The Recorder once again cancelled an alert from the Chaos Computer. PLATO caught it, and the Recorder just erased the event from PLATO's memory bank. (Force Works#5/2) - Fisher Todd showed Rachel Carpenter the VRoom Room and the Recorder activated an advanced Scatter simulation while they were in it, thus causing a dangerous situation for them which had to be cleared by Spider-Woman. (Force Works#6, Marvel Comics Presents#169/2, 171/2) - The Recorder accompanied Force Works on a mission in China (the alert the Recorder had cancelled last issue). Recorder stayed on the Hex-Ship Pegasus and observed Force Works fighting the Avatars. (War Machine#9) - Recorder stated the obvious to Force Works by telling them that all Avatars except their captive Lich got away. Recorder stayed on the Hex-Ship Pegasus and flew with Force Works to Mandarin's castle, but it shut down when they entered Mandarin's anti-technology field. (Iron Man I#311) - The disabled Recorder was motionless in the Hex-Ship Pegasus while it crashed. (Iron Man I#312) - After Mandarin's defeat the Hex-Ship Pegasus and the Recorder were brought to Hong Kong. The Recorder was running again and wanted to know everything that occurred while it was off-line. (Force Works#8) - Recorder observed the strange behavior of the Works' residents on Christmas Eve. U.S. Agent gave a camera to the Recorder to record the party. Some guests were annoyed by the Recorder's taping while others were interested in the machine or babbled drunken nonsense. The Recorder taped Century talking about his memories. The tape was later given to Century and he watched it again and again. (Force Works#11) - On another mission to Slorenia the Recorder stayed with Century on board of the Hex-Ship Pegasus. Angered by the fact that Century was doing its job it knocked Century out after awhile with a wrench. Then it sent out cameras to observe Force Works fights in Slorenia. (Force Works#12) - The Recorder watched with joy the many dangerous situations the different Force Works members were in. Century gained consciousness again and attacked the Recorder who fought back until Century decapitated it. Force Works decided to put the Recorder into the Vault after the situation in Slorenia was cleared. (Force Works#14 (fb) - BTS) - The Recorder was brought to the Vault. Sensing the Skrulls approaching Earth, the Recorder's original re-programming overtook it again and it planned to free Starstealth so that they could complete their mission. (Force Works#13) - The Recorder took over the Vault's computer, disabled the Guardsmen, and opened the cells of the imprisoned Kree. Force Works arrived and Century found the Recorder in the Vault's computer core. The Recorder attacked him with the Vault's security system. Meanwhile, Iron Man found a way to stop the Recorder by short-circuiting it with an E.M. overload. Iron Man's plan worked and Force Works finally realized that the Kree had something to do with the Recorder's strange behavior. (Force Works#14) - The Recorder was handed over to the Rigellians on the Skrull Tribunal Ship which came to Earth to arrest Starstealth. The Rigellians found customizations in the Recorder. Shocked by this abuse the Rigellian wanted to contact his people immediately. The Recorder went on-line again and killed the Rigellians. After that it took the ship under its control through the auxiliary computer annex on deck sixteen. It made his loyalty to the Kree official and teleported two escaped Starstealth members on board. They were defeated by Century and Scarlet Witch. They teleported to the Recorder's location and listened to its story. 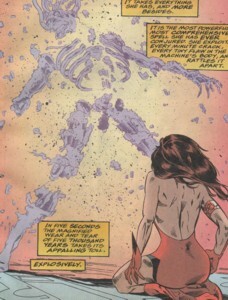 The Recorder mocked them when they threatened it, but then the Scarlet Witch used her powers to destroy it. The Recorder was rattled apart like it had aged five thousand years in only five seconds. Comments: Created by Dan Abnett, Andy Lanning, Tom Tenney & Rey Garcia. The Recorder had no gender and was therefore an "it". Hard to stay with the it because the Recorder looked like an "he". I chose the designation RE-404 for this Recorder because it was a reprogrammed, malfunctioning Recorder unit. "RE" should stand for "reprogrammed" and "404" should stand for its malfunctioning because "404 Error - File Not Found" is the most common error on the Internet which is kind of appropriate for this Recorder because there seemed to be some files missing on its hard drive as well. Who could have been the "someone" who customized the Recorder? Who knew everything about Hala's destruction? Who knew that it was easy to blame Wonder Man and Vision because they were the last on board with the nega-bomb that destroyed Hala? Who was responsible for all this? Because I don't live on the moon (and this "someone" did) I know the answer: the Supreme Intelligence. "Powers/Abilities" was partly taken from the Official Handbook of the Marvel Universe I#9 from the Recorder entry.